Our portable security gates are manufactured with super duty galvanized steel that can endure year round weather conditions like heat, rain and snow. Folding security gates can also withstand the harshest commercial chemicals or cleaners. 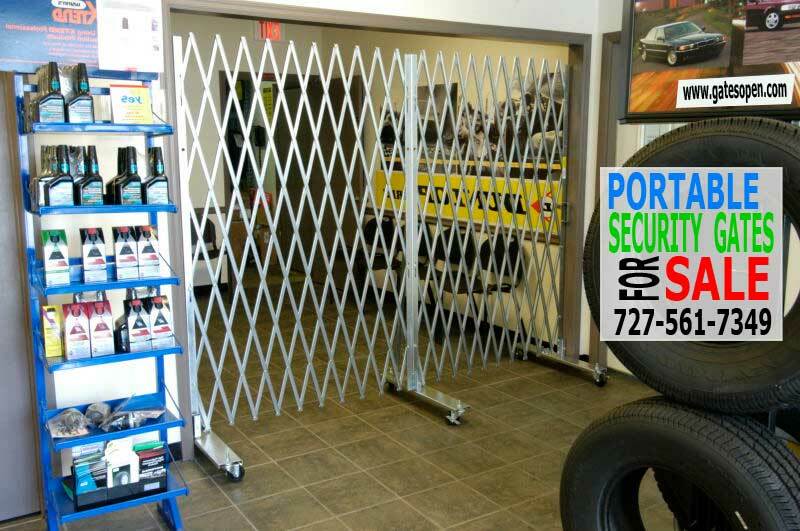 Portable security gates fold up and roll out of the way and out of sight when not being used. Mobile security gates are perfect for temporary access control that seals off access to any area temporarily and still allow multiple entry points. Tampa Bay’s portable gates are Riveted with aircraft grade aluminum Rivets. Aircraft quality rivets hold up to more stress and they will not rust, crack and the webbing will not split. Have an unusual size space to secure? No problem we can custom build a portable gate to your specifications. Our portable access folding gates can be used practically anywhere and any way you need them, including, sealing off school hallways, closing elevator banks, close access to offices, factories, industrial plants or warehouses. Because gates are easy to fold up they allow easy access again. When portable gates are folded, they’ll roll through any entryway and can be stored in a closet! Portable Security Gates from Tampa Bay Security Door Gates are perfect for providing temporary access control in any area — including entryways, hallways, warehouse bay doors, retail isle access control — anywhere temporary access control is needed! Click Here For A FREE Security Gate Quote.